Pokemon can apparently even make a calendar soar to great heights. We all know that the Pokemon videogames sell lots of copies, but something else Pokemon related beat them out to set a Guinness world record. You may not believe it, but a Pokemon calendar is now listed in the record books as the most popular calendar ever. 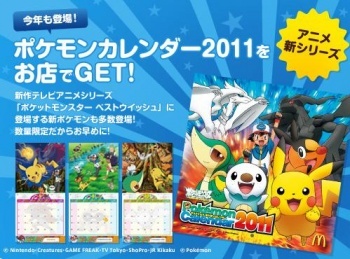 In Japan, McDonalds has offered a yearly Pokemon calendar since 2006. Though it's sold over one million copies of the calendar's individual versions in the past, this year saw a record-breaking amount of sales. From November 6, 2009 to November 5, 2010, 1,476,442 people bought the 2010 version of McDonalds' Pokemon calendar. According to the Guinness Book of World Records, selling nearly 1.5 million copies of a calendar in a single year is the largest amount of sales any calendar has ever seen in that time frame. The boost could have been the result of Pokemon Black & White fever, which just released this year in Japan, or it could be that the calendar only costs around $3.50, so it's a must buy for anyone that happens to get a hankering for a Filet-O-Fish. The McDonalds' Pokemon calendar features various scenes of Pokemon in action and cute little Pokemon icons that can be used to notate special days. The 2011 version will feature the new Pokemon from Black & White, so it may become even bigger than the 2010 version. How can other calendars expect to compete?